Has a positive impact on the behaviour of children in school. The DfE’s non-statutory guidance on school uniforms (2013) supports these beliefs and strongly encourages schools to have a uniform. By allowing their child to attend Carrfield Primary Academy, parents/carers are expected to support the school uniform policy. It is the responsibility of the parent/carer to ensure that their child has the correct uniform, and that it is clean and in good repair. School advises that all items of uniform, PE kit and any other items (e.g. wellies, coats, bags) should be clearly marked with the child’s name and class. If a parent/carer would like to modify the school uniform policy for their child, for example on religious grounds, they should make representation to the Head Teacher. School will look sympathetically at such requests. 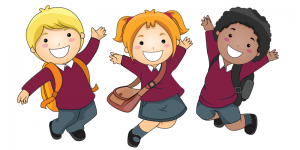 The school uniform policy is reviewed annually and a reminder leaflet is sent home to parents and carers prior to the summer holidays. Parents and carers of new starters to Carrfield will also be provided with a copy of the uniform policy and the leaflet prior to their child starting. Alternatively, children may also wear burgundy and white gingham summer dresses. Branded Carrfield school uniform (jumpers, shirts, bags, hats etc) can be purchased from the TESCO website (www.tesco.com/ues) but plain uniform without school logos are also acceptable. Sports top, e.g. tracksuit top or hoodie. School encourages that if parent/carers wish to have their child’s ears pierced, this should be done at the start of the summer holidays so that children do not have to miss PE lessons – children must be able to remove ear rings for PE or swimming lessons. We cannot take responsibility for any items of jewellery that go missing in school.